Busy mums don't have time to do their hair right?! Well that was what I thought before being introduced to the Dyson Supersonic hair dryer. I get asked all the time if it's really worth the hype and the answer is YES! Not just because it dries my hair so quickly, but the in built heat control mechanism helps to ensure hair isn't exposed to excessive temperatures. I only wash my hair 1-2 times a week, but use the dryer in between to finish off my styles as well. HALF PONY/HALF TOP KNOT | My go-to style on day 2 and 3. I add a little dry shampoo if needed to get some volume back and just style with my fingers. Takes less than five minutes as hair is still bouncy from the blow dry. SLEEK & STRAIGHT | my other post washing go-to. Blast dry and finish off with the smoothing nozzle. Sometimes I will finish off with a straightener. NATURAL BEACH WAVES | This is my hair's natural state, so this is quite easy for me to achieve and it's a style that looks better a day or two after washing. Wash hair and dry off with the diffuser attachment , pop it in a top knot for a few hours. Take it out and add some sea salt spray. THE TOP KNOT- AKA- "mama's best friend" | If all else fails or my hair is due for a wash this is my go-to. 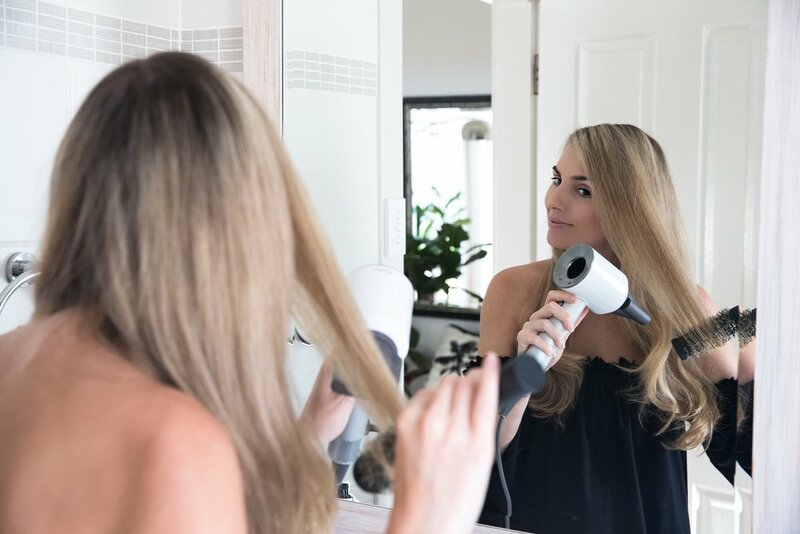 Find out more about the Dyson Supersonic hair dryer at www.dyson.com.au/supersonic and in the lead up to Mother's Day you can also purchase with the special edition blush pink case.